When you attend a major fraternity gathering or affair, you should be clean, coifed and perfectly accessorized. 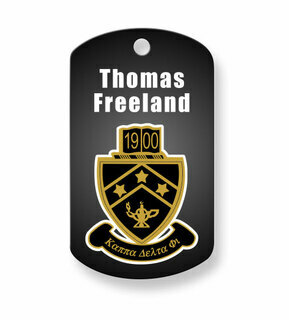 Every accessory you might need can be found in Greek Gear's catalog of Kappa Delta Phi Jewelry, Rings, Cufflinks & Watches. 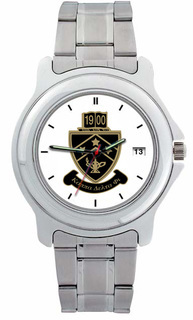 You probably buy plenty of gifts for yourself throughout the year, including clothes and home goods, but no item is as unique and meaningful as a fraternity watch. It's a gift that constantly lets you know what time it is. Our wristwatches come with classic precision quarter 3 hand movements, and a face that features the KDP crest at the center. If your usual way of carrying cash is to stuff crumpled up bills into your pocket, make an upgrade to a Pewter Money Clip. It's designed to hold a stack of bills and even a few cards. There's an image of your crest encircled by a wreath on top, so every time you pull this clip out of your jacket to buy your breakfast or lunch, you'll be reminded of your fraternal affiliation. Ordering Kappa Delta Phi Jewelry, Rings, Cufflinks & Watches will help ensure that you always have something nice to accessorize your suit, tux or business casual outfit. Add something special to your shopping bag today! Kappa Delta Phi Jewelry, Rings, Cufflinks & WatchesThe Greatest Selection. Period.